Thinking about it, I’m realizing that I’m not using the voltage control over the parameters of sapel enough, yet. Would be very interested to hear patch ideas for those. That tends to do interesting things with random sources. 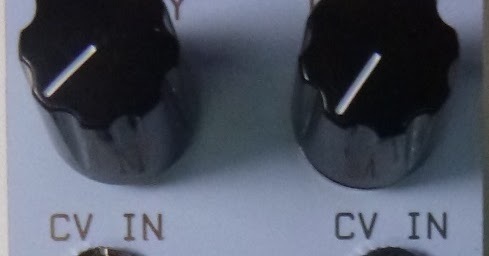 I don’t know the Sapel other than it’s based on the Buchla design which should mean that you have the ability to do reasonably subtle randomisation of your random (if that’s what you want) by limiting the range of the CV you patch back into one of the other CV inputs. I think random modules are one of the best things about Modular in general. They also seem to be something that most soft-synth’s and standalone instruments etc. overlook. I love my Wogglebug (although to be honest I’m still not sure what all the controls do… ). It’s become one of my favorite modules. Using the audio outputs feeding Rings inputs is great. Looks like slow smooth random is popular with a lot of folks here. The Non Linear Circuits ‘Triple Sloth’ looks to fit that bill perfectly (been meaning to build one up for a while). First post here because random/chance/accident inform pretty much all I do musically. Just put this together the other day that combines some different approaches. Shapes is the master clock but I’m thinning that right down by using it to clock S/H noise and feeding that to a comparator. So the comparator only gives a trigger when the random sample > an arbitrary fixed voltage but the trigger will always be in time with the master clock (not that that is essential here). That trigger then drives Disting’s Turing Machine setting to randomly generate a melodic line which I can lock and unlock manually. I like lots of unique random sources for most parameters in a patch. Take a simple “mono synth” type patch with a single square wave from one VCO into a filter then into a VCA. Envelopes to VCA and VCF. I like patching a stepped random (S&H) into the PWM of the square/pulse that’s triggered by each note in sequence. I like all stepped changes to be ‘per note’ rather than constantly clocked changes. So each new key press or active sequence step will give a new random value. I’d then do the same for the filter cut off and resonance with two more unique stepped values. These would all be heavily attenuated. But it gives a lot of movement and life / humisation to a patch. The next step would be using a VCA between the envelope modulation and the filter. Bias/open the VCA to where I like the envelope depth to be but then add some attenuated modulation to the VCA too. So that also changes how deep the envelope it. Then do the same to some time or shape parameters on the envelopes modulating the filter and VCA. So you have tonal changes on the pulse and filter, envelope depth on the filter changing, and enveloep shapes and times changing. Lots of attenuation / attenuverters (if not on the modules) is key to getting the most of it. But lots of subtle bits of random works great. My other take on this is using lots of smooth sources on similar parameters so things just drift a bit, different vibe but also very nice. In Live I use a maxforlive device randomiser on various plugins, it usually sounds horrendous - then i spend time un-weirding it, disabling randomisation and automations til it sounds (ideally) interesting but listenable. @TheTechnobear 's orac allows for a lot of experimentation and random pairing of modules which is fun. Cool topic. This little patch is created from a short sample from “Bob the Bob” with The Lounge Lizards in Morphagene getting tweaked by Wogglebug, Rings and E330 are trying to play along with a 16 step sequence from Voltage Block and the CV out from Morphagene is clocking the whole thing. DivKid on Lines? What does it all mean? Agree with all of this, the other thing I like to is attentuated random on a VCable envelope. Typically the decay portion. Not sure it means much, although it was Tom Hall’s video with the Nebulae from Qu-Bit and the 16 fader bank that brought me here. Although I’m really into the little module “Nearness” that originated through here too. Yeah the CV over shape/time in the VCable envelope portion I mention. I feel like all the random sources are just “life” or “liveliness” and it’s worth exploring them on most parameters in subtle amounts. A little 2 minute diary using all 3 of the topic headers. Accident - was discovering a mix of Shapeshifter chorded fed into a frequency shifter that gave up a nice rhythmic beat frequency kind of pulse. Random - using the output of the Nanorand to bend the pitch of the Plonk percussion voice. Overall the effect that emerged was something similar to a bodhran. Agree with DivKid in that attenuation is always randoms friend. It’s often just a touch of variation in the tiny details that lift a patch into something that has real life to it. The subtleties that you don’t notice are there but you know when they are not there. I have a Nearness. It’s cool. This technique reminds me of a technique I read about when 3D modelling: Starting with a clean symmetrical model, push and pull points until it’s distorted, then try to put everything back by hand and you end up with something much more organic. Breaking a preset with the randomiser then fixing it by hand seems like the musical equivalent of this. Definitely going to give that a go myself! If any of my fellow TT nerds feels up to it, I’d love to see a CHAOS operator featured in a small scene. In almost all of my patches I use the Wogglebug’s random CV outputs and a randomizer Ardcore sketch to ‘humanize’ the sound somehow. Even very slight random variations to parameters like envelope length, filter cutoff, etc have a significant psychological effect. I agree with zebra’s take upthread that it is tempting to just leave this stuff in, but ultimately it makes for less satisfying listening. What I end up doing is recording various parts in takes and choosing the ones where the randomness lines up the most neatly. Alternately, if I hear some random interaction or movement that is particularly pleasing, I’ll try to find a way to engineer that deliberately, and often discover something new along the way. Ultimately, though, I struggle with chance and randomness, because my personality likes to be in control. Having worked with computers my entire life I have the built in feeling that “undo” is right there, or that “perfect” is attainable (which, in the digital sense, it is). This tendency is a bit of a hindrance to creativity; the part of my mind that wants to put things in order fights with the part that can appreciate the aesthetics of asymmetry and disorder. Right now, the former part is more agile and well-trained than the latter, but with practice the balance seems to be shifting. You should be able to do this with the ‘random’ midi device. Put a random device on your chain and set the chance as you want it, choices to 1 and scale to max. Wrap your instrument/vst/whatever in a group (instrument rack) and set the note range for the chain to include the midinotes you want but not the super high notes generated by random (should be several octaves above. If you need per note probability you can automate the chance in the clips. This M4L device should do what you’re after. I haven’t used it for a while but I’m pretty sure it preserves velocity data and just uses the usual Max approach to note probability. This is also my first post. Hello!